How to do 64-page magazine that has 2-colour run and inserts that have 1-16 Roman numerals in? I am using InDesign CC 2015 on MacOS Sierra. Currently, I am creating a magazine that has 64 pages in total, with pages 5-24 and 41-60 on newsprint, and 2-4, plus 61-64 are on glossy paper, with 16 pages in as a glossy insert (I-XVI, although technically it's pages 25 to 40, numbered as 1-16 in Roman numerals). This is on a 204mm width x 280mm height in paper size. My problem is - this is a 2-color run, and many, but not all advertisers are in color, but some have pictures in grayscale (stock photos from library that are reused - in JPEG format; some are reused and I make a copy of the original folder for linking to them for modified ones, currently I convert the copies to grayscale in Photoshop CS6 but is this always the best way?). Should I do this as a book, or one large .indd file before it gets sent as a PDF? This is not an actual magazine that's going to be printed by a commercial printer (yet) - it is purely one that I am creating to learn how to do specific things on InDesign. How to deal with numbering issues (pages 2-4 and 61-64 aren't numbered due to full-page ads, but pages 5-24 and 41-60 are numbered in the header), and deal with Roman numerals for separate insert between pages 24 and 41 that's glossy paper. If anyone can help I'd appreciate this! Page numbers - You want to place page numbers only on pages you want them, or remove text box if you place it on master page. For roman numbers in Layout > Numbering & Section Options you can chose style "I, II, III, IV..." and start counting from 1. This information is contained in the "Numbering pages, chapters, and sections" of InDesign online help. So you have a couple of different issues/questions here. As was pointed out in the comments--if you were actually producing a magazine like this, you would have to let the advertiser know whether their ad was going to be produced in two colors or greyscale, and create specifications for the ad artwork that matched the final output. As a "publisher" you don't have the ability to optimize each piece of artwork you receive for use in a two-color environment (which is really what you are describing; in some cases the two colors are a specific hue (with shading) and white, or black (with shading) and white. In your specific situation, where you are making this as a test sample, and are creating all of the artwork yourself, I think your workflow using Photoshop to make the greyscale version of your images is your best option. For the page numbering issue, I would create three different master pages. Assuming there are other elements on your master pages beyond page numbers, I would start by creating a master page with no page numbers, then create a second master page with page numbers that are formatted to use standard numeric characters (i.e. 1, 2, 3, etc.). Last, create a third master page based on your master page with page numbers, except on this third master page, you will change the format of the page numbers to roman numerals. As @SZCZERZO KLY stated, you change the formatting for the page numbers on any specific page by selecting that page in the pages panel, and then going to Layout>Numbering and Section Options. Then, as you create new document pages, you can apply whichever master page is appropriate for each specific page. It is not clear from your question whether the section with roman numerals is supposed to start at one or continue with the numbering of the rest of the document. 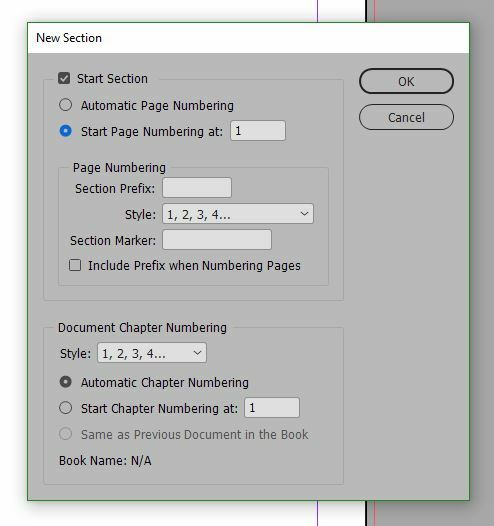 If it is continuous, make sure that both of the master pages with page numbers have "Automatic Page Numbering" selected on this Numbering and Section Options screen. If the section with roman numerals is supposed to restart, select the page where this section begins, open up the Numbering and Section Options menu, and set it to start a new section, and start page numbering at 1. If this is the case, when you return to the regular section of the document and need the standard numbering to continue, you may have to follow the same process as above, starting a new section, and then telling it to begin numbering based on the last number before the glossy section. Not the answer you're looking for? Browse other questions tagged adobe-indesign color color-conversion or ask your own question. How can I prepare a magazine file for print? How to get PDF as glossy pages for cover and back pages, and newsprint for Inner content [inDesign CC]? InDesign: how to prepare file for printing perfect bound magazine? How to change this TOC hyperlinking script so that the entire paragraph, not just the page number, functions as a hyperlink?